之前的程式有用到 ## 減少一些重複的程式, 當時是放在 Linux kernel 2.4 上面, 用的是 gcc 2.95.3, 不過因為改寫到 Linux kernel 2.6 的緣故, 所以 gcc 改用 3.4.6 . 這時就出現錯誤訊息了. 今天在用 Google Reader 的時候, 看到這張圖片……. 11 月 20 日, Adobe 又釋出了新版的 FLAH. 這次仍然有 Flash 9 Plugin 和 Flash Player . 將 export XLIB_SKIP_ARGB_VISUALS=1 放在.xinitrc 內. 就是將多個封包合而為一, 一起傳送出去. 主要還是減少大量封包傳輸時, 減少 Control Packet 的 Overhead. 這些都是作用在底層的協定(Layer 2), 在實務上, 你用 Sniffer 並不會看到這些技術出現. 一般來說, 大量資料傳送都會使用 Block ACK . 而個人認為 Block ACK 也很像是 Scaling Window 的機制, 只是比較簡單, 不需要去判斷 Bandwidth. 畢竟一個 ACK 也是要耗用和一般 Packet 差不多的時間去處理(當然 Memory Copy 的時間少很多). RIFS 就比較容易理解了, 就是在 Frame 和 Frame 中間並沒有一些 Delay 或是空白的機制. 從這一張圖表可以很清楚的看到, AMPDU 就是將數個相同目地的資料, 集合成一次送出, 以減少底層 Hand Shaking 的時間, 同時也可以減少 Header 的重覆傳送, 以達到快速傳送的目地. 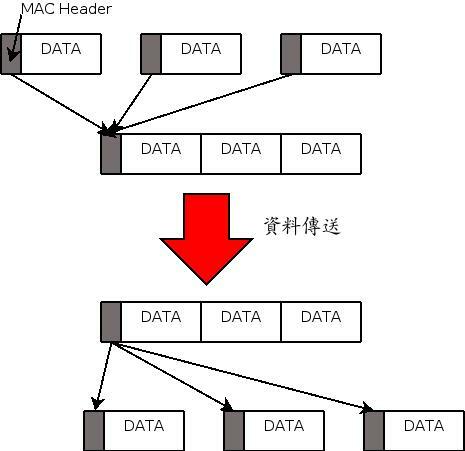 和 AMPDU 不同的地方在於, APPDU 是 Physical Layer Header 集合在一起. 一般來說, Aggregation 對於 Bulk Data Transfer 的效用並不大, 將 Header 減少的效用剛好在處理 Aggregation 這一段時間就補回來了, 但是 Aggregation 對於小封包就很有用了, 這時 Header 佔小封消耗的時間就比較多了. 這樣的處理如果在 x86 內, 一點問題也沒有, 畢竟 x86 速度快, Memory Bandwidth 也大, 所以程式寫爛一點也沒有關係. 但是在 Embedded Linux 下, 畢竟資源有限. 我們看到這個圖, 總共有幾次的 Memory Copy 呢? 答案是 3 次, 比起一般的收封包, 多了二次, 也就是三倍的 Memory 頻寬耗用量, 這還不包含 CPU 處理的時間. 所以 Driver 這樣寫, 真是大方呀, 據我所知, 大概只有那家將文書編輯軟體內放模擬飛行的公司可以比而己…..
這只是一個很簡單的例子, 在 Embedded Linux 下寫 Code 要特別小心, 並不是每次都有什麼 IXP420 266Mhz or 400MHZ+ 甚至是 C7 這樣高階的 CPU. 常常的狀況都是比較低階的 CPU . The patent–issued on Valentine’s Day–covers all rich-media technology implementations, including Flash, Flex, Java, Ajax, and XAML, when the rich-media application is accessed on any device over the Internet, according to the patent holders. 十年前, 我選用 Virtual Foxpro 做為開發程式, 以今日的眼光來看 VFP 還是一套非常好用的輕量化資料庫語言. 我整個程式庫壓下來才 1440K, 剛好可以放進一張磁片. 懷念那個年代寫 DB 很簡單的日子, 後來的 Delphi or VB 老實說都太難寫了, 不符合 DB Language 嘛. 我只能說, 我很久沒看 Code 了, 完全不知道做了什麼事. 所以翻修的 Code 只有改名字 XD . Linux 是不是應該有 Binary Driver Layer ? 最近在吵的是, The Japan OSS Promotion Forum 提出了 GKAI(General Kernel API Interface). 而跟著這個 GKAI 提出來的, 就是 Go Taniguchi, Turbolinux, Inc. Kenichi Hori, NEC Corporation. 提的 New Device Driver Structure. 這個 Structure 最大的改變就是在 Linux 上加上 Binary Driver Layer . 以便可以像是 Windows 一樣, 載入 Binary Driver ..